Welcome to Fairy Tale Fortnight! Ashley and I have talked your ear off about this for, um, months now, so I hope it lives up to whatever you may have been expecting. In this post you'll find the schedule of happenings -- reviews, guest posts, interviews, giveaways, zaniness, etc. You can treat this as the landing pad. The schedule will be updated daily with what is going on that day on both blogs, as well as a preview of what is to come the next. Every post will have one of these three buttons; just click the button to be taken back to this landing page. *please note: Some things will be posted on both The Book Rat (TBR) and Basically Amazing Books (BAB). When this is the case, we will say so. If it is a giveaway or linky, please note whether it is on both blogs and only enter once unless otherwise directed. 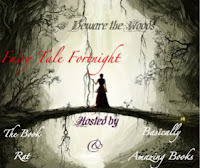 Note to guest bloggers: Take note of the books mentioned through out the event; 1 of you will win your choice of either 1 of the books mentioned or a mystery box of fairy tales chosen by me! If you would like to share your own fairy tale whatnots, please see the Linky page. Also, make sure to check out A Backwards Story throughout the fortnight. Bonnie, being the fairy tale lover and all around ball of awesome that she is, will be posting reviews and general coolness to coincide with our event the entire time, as well as sending some pretty awesome interviews our way! Pre-schedule: FTF Sneak Peek Giveaway of Awesome! Signed books from Donna Jo Napoli -- 15 winners! Guest Post: CSI Librarian: "Winter's Child"
Guest Post: Her Royal Orangeness "Tam Lin"
Giveaway: The Healer's Apprentice from Velvet of vvb32 reads + Fairy Tales in Bruges! Interview: Zoë Marriott, author of Shadows on the Moon, et al. Poetry Shmoetry: Fave fairy tale-esque poems. Interview & Giveaway: Carolyn Turgeon, author of Mermaid, Godmother, et al. Thanks for joining us, everyone!! I'd like to do a post for your fairytale fortnight, If I do it, would you link it from your blog?